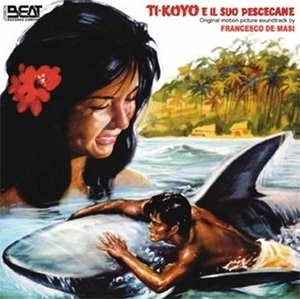 Francesco De Masi's Ti-Koyo e il suo pescecane is the 340th Soundtrack of the Week. This record has lots of "island" exotica music, as well as some easy-listening sonic wallpaper. It's mostly very ncie to listen to, swaying, lyrical and enchanting. "Manidu" is a particularly strong cue with great electric guitar playing. Dramatic underscore is also served well, in such pieces as "La caccia ai pescecani" for example.